We produce for Italy and abroad silicone molds for gelato tubs and ice cream cakes decorations. 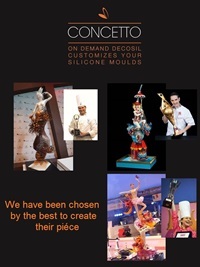 Italian leaders of silicone moulds, we create and sell for over 10 years silicone molds for gelato tubs and ice cream cakes decorations, food safe silicone moulds worldwide to confectioners, bakeries and Delicatessens. decosil® decoTablet allows you to get, in an easy and simple way decorations for your handmade gelato tubs, making them irresistible to young and old. Use the mold to room-temperature and fill shapes with Arabeschi®, to avoid the formation of air bubbles let vibrate the mold and place it in the freezer at -40° C.
Use the cool mold, fill shapes with Topping (Salsa - Coriandolina - Stracciatella), to avoid the formation of air bubbles let vibrate the mold and place it in the freezer at -40° C.